Ultra-quiet plinking round. 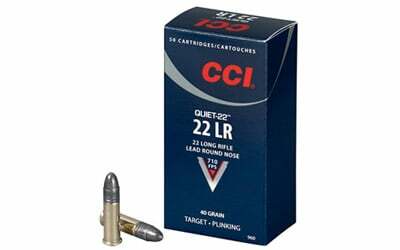 75 percent reduction in perceived noise of standard .22LR. Excellent accuracy and low velocity (710 feet per second). Ideal for bolt-action and single shot, but perfectly safe in semi-automatics. No hearing protection required. Perfect for legal shooting areas where noise may be a concern.